The DEVITA PROFESSIONAL constitutes one of the most sophisticated bioresonance devices manufactured by Deta Elis for the diagnosis and treatment of illness, being able to identify potential causative factors as well as their severity. The therapist that learns how to use the Devita Professional competently will be a master Holistic Practitioner that will be most sought after. The Deta Professional has been recognized by the Ministry of Health of the Russian Federation and Israel and other countries as an official method of diagnosis. 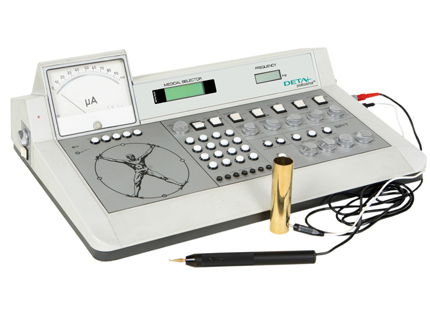 The refined DEVITA PROFESSIONAL device is based on the research of Dr. R. Voll (Voll diagnostics), as well as Dr. Schimmel (Vegetative Reflex Testing – VRT, and its inventor Dr Sergei Konoplov. The precision of the device is close to 100% and so is its accuracy, but it is the experienced diagnostician that gets the best results. It has a vast spectrum of possibilities for the diagnosis and treatment of complex diseases as the practitioner is able to identify a wide variety of potential causative factors for the individual patient. Identification of food intolerances causing internal inflammation. The pathogenesis of disease states. Negative energies such as mobile phone stress, electromagnetic stress, geopathic stress, Wi-Fi stress, negative spin, etc. Detection of toxins and heavy metals. Psychoemotional states and much more. This covers a wide array of different factors that may interrupt the proper functioning of the cells and tissues, including toxins, food intolerances, inflammation, degeneration, negative energies such geopathic, electromagnetic, mobile phone, X-ray and general left-spin energies, as well as the wide variety of microbes including parasites, protozoa, bacteria, fungi and viruses. All these can be tested for and more! An important advantage of this method is that it can predict the effectiveness of the therapeutic protocols and provide information for adjusting and fine-tuning the treatments. This helps to economize time and money for the patient, as well as removing the stress of complex protocols that often fail. It should be the right-hand of every doctor’s office as it is second-to-none in providing information on potential causative factors that are often missed with more conventional medical tests, as well as providing a bespoke treatment programme for the patient based on the information collected, avoiding guess work. It can be used by professionals such as medical doctors, homeopaths, chiropractors, osteopaths, naturopaths and other main-stream health professionals. Can produce homeopathic remedies, nosodes, organ remedies, antidotes to toxins and autonosodes from saliva, urine, blood etc. Patients can go to a qualified Deta Elis practitioner who will test them and determine the underlying causes of their health problems. The practitioner can then programme the patient’s DEVITA AP or DEVITA RITM with these specific frequencies and instruct on how to use these frequencies. Electronic Pharmacological Selector Module – contains 22,800 digitized remedies of a wide variety of homeopathics, as well as a further 25,200 empty memory slots to input your own remedies, foods and homeopathic remedies. The maximum number of remedies that can be given simultaneously to a patient is 18.